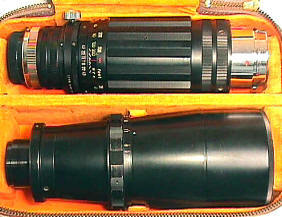 500mm was not a common focal length for Exakta, any Exakta mount 500 is hard to find today. This Komura 500/7 from the 1960's and offers a nice design and good craftsmanship. 1960 list price was $175. 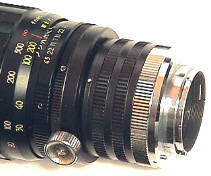 Komura was an independent Japanese lens maker. A manual aperture lens with interchangeable mounts, it breaks down into two pieces for compact carrying, and comes in its own velvet lined case. 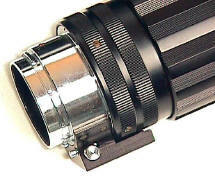 A heavy chrome bayonet mount fits the lens together. It also had a built in tripod mount and a rotating camera mount. 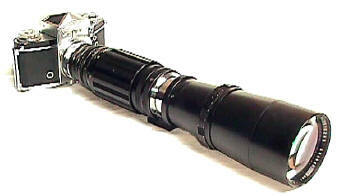 Weighing in at almost 3 1/2 lbs, the lens measures in at almost 14" long, with a not so close focus distance of 26 feet and a filter size of 77mm.